Are you searching for a reliable craft shop in Guttenberg, NJ? Trust none other than Marlene Trimmings! Our company is known for our top-quality trimmings. We believe in servicing and providing our customers with the highest quality and greatest selection of original designs. 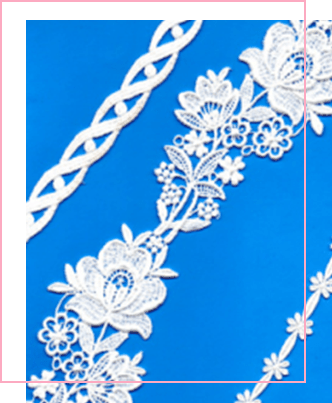 We carry a variety of styles that will satisfy a diverse range of designer needs—from Liturgical trims to bridal lace trims, cotton trims to metallic/mylar trims, and so much more! With over 43 years of experience, our craft shop is no stranger to the ever-changing garment trade industry. Our journey began on April 1st in 1970 as Marlene Embroidery. We grew from being a 2-embroidery machine shop to having 18 machines in 4 factories producing for some of the top fashion houses. Throughout those years, we developed relationships with top-notch designers and retail merchants throughout North America, Central America, and South America. Today, as Marlene Trimmings, we are only merchandisers of our products. We continue to bring new styles to the hands of designers and retail merchants as where “Fashion comes Alive” from Marlene, Innovative Designs. Make us your preferred craft shop today! Our inventory features a wide array of craft supplies perfect for any of your fashion or home renovation projects. Do you want to learn more about the products we offer? Feel free to contact us through this website. We hope to hear from you soon!